Yard Limit Signs: 1,161 feet West of station. 8,280 feet East of station. Spring switch at entrance to east end of yard protected by automatic signal 1461 and S.P.S. 1473. Rules 104a, 451 to 454 and 501 to 519 applicable. Telephones located opposite signal 1473 and at spring switch. Signal 1481 located approximately 4000 feet west of signal 1473 governs westward main track movements to signal 03 on Oba Subdivision located just west of coal chute. Rules 601-681 applicable. Signal 04 on Oba Subdivision located just west of west entrance to Foleyet yard governs eastward movements to "block end" sign located opposite signal 1481. Under Rule 93 note reading "where automatic block signal system rules are in effect 'known to be clear' includes when track is known to be clear by signal indication" is not applicable at Foleyet. Trains leaving east end Foleyet yard must not exceed 25 miles per hour until the entire train has passed through spring switch. This does not relieve them of requirements first paragraph Rule 104a. 1937-06-05/21 CNR tenders for construction of 150-ton concrete coaling plant structure, sandhouse, etc. at Foleyet The Globe and Mail (Toronto), Tuesday, June 8, 1937, p. 21, c. 8 . 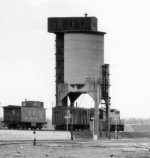 CN Photo Collection / CSTM / Image 54877 Coaling tower. 1926-12-17 NAC RG30M, Acc. No. 78903/42, Item 248 C.N.Rys. Proposed extension to station for telegraph equipment. Dwg. No. C2893. Track side end elevations. Ground floor and first floor plans.